Charlaine Harris, creator of the much loved Sookie Stackhouse series (True Blood anyone? ), has entered the stakes again with the first book in an entirely new series. 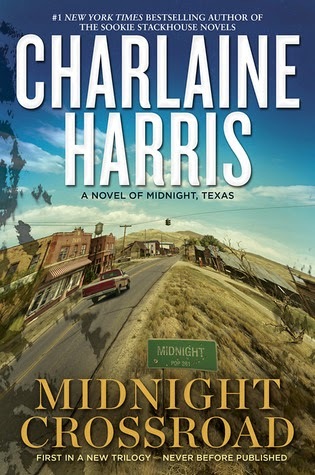 Midnight Crossroad is a mystery story about a rag-tag bunch of misfits who live in this small town in Texas. When I say rag-tag, that doesn't really tell you the half of it. We have Manfred, who is a psychic of sorts. Fiji, who is a witch, of sorts. Lemuel, who is a vampire - yep, you've got it - of sorts. Olivia, who is .... well actually, nobody really seems to know exactly what she is. Bobo has landed in Midnight after running to get away from his past. Joe and Chuy run the Antique Mart and Nail Salon, and there's a hint of something not quite normal there too. Let's not even mention the Rev, who runs the small wedding chapel and pet cemetery. Oh, and then there's Madonna, Teacher and baby Grady who run the diner and do odd jobs respectively. Who else? Oh yes, Shawn and his kids, Creek and Connor, who own the gas station - definitely something odd there too. Oh, and let's not forget Mr. Snuggly, the talking cat - he is just hilarious. Getting to know these disparate and intriguing characters was a lot of fun and the eventual solution to the mystery of Bobo's girlfriends' disappearance took me completely by surprise. A fairly lighthearted story, with some definite dark undertones, I'm certain that Midnight Crossroad will delight mystery and urban fantasy fans, and I'll happily read the next in the series.